I am not one of those people that finishes their Christmas shopping early. I usually don't even start until after Thanksgiving. I am a one holiday at a time kind of person. So when I do get around to wrapping gifts (*cough*cough* Christmas Eve *cough* cough* ) I never remember cute Christmas gift tags. You usually get a name written on the wrapping paper with a Sharpie. 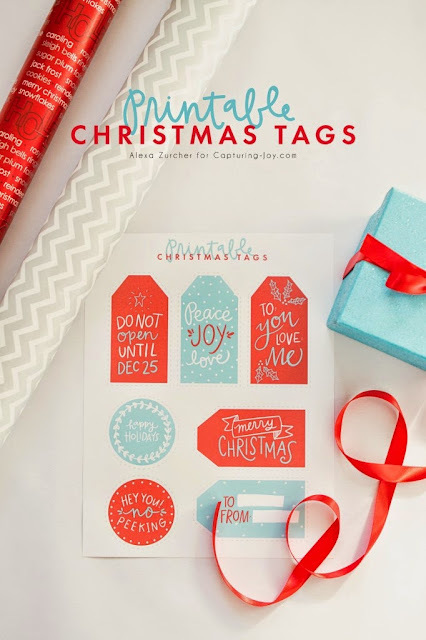 If you usually find yourself in a similar position, then just remember (on Christmas Eve) that you can head over to Capturing Joy and print out a few sheets of these cute printable Christmas gift tags that Alexa Zurcher created. You can also check out more of Alexa's printables, including some great free Christmas prints, over at He and I. This is seriously the most awesome thing ever. thanks for this lovely lil diy!